Actroid F can speak in your place, using webcams to watch and mimic your facial expressions and movements. When you speak with your family over a webcam they may be able to see your face, but they don’t have a real body in the room with which they can interact. Why not give them a creepy robot to to talk to instead? Kokoro recently unveiled its Actroid F telepresence robot, a full sized female humanoid with complex facial movements and realistic appearance. Though it can’t move from its chair, it can blink, shift its eyes and neck, bow, and even breathe. A webcam on your end watches your face and head movements and has the robot mimic them for your family. It’s one of the most complex and human-like telerobots ever seen…and it really freaks me out. This thing is sort of the epitome of the Uncanny Valley, it’s just real looking enough to trigger your “something’s wrong with this person” alarm. Watch the Actroid F speak, nod, and smile in the videos below. Maybe I watched one too many Child’s Play movies, but I would not leave this thing alone with my family. 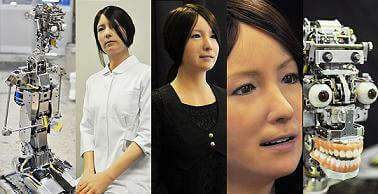 Actroid F is a modified version of the Geminoid F female robot that we discussed earlier. A lot of effort has gone into making these robots simpler, cheaper, and easier to power. The air compressor and valves that control Actroid F’s motion can run off of household electricity. Actroid F is also 30 kg lighter than other full scale robots in the Actroid/Geminoid series. The webcam setup for telepresence is meant to be as simple as possible while still providing the right experience for the user. To talk through Actroid F you need three cameras: one aimed at the speaker to pick up facial expressions and movements, another camera showing the Actroid’s face so the user can see how the robot is conveying her emotions, and a final camera that shows a panoramic view of the robot interacting with people in the room. A little more complex than your standard Skype portal, but that’s to be expected when you are speaking through a robotic avatar. Pay attention in the videos below to see how Actroid F can clearly pick out face and head movements, and adjusts its eyes to follow sound. 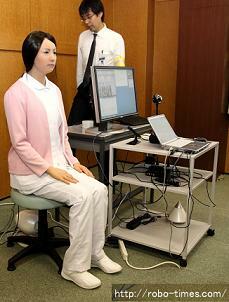 This is a very life-like robot…which, again, is probably why it can be so eerie to watch. This video was taken during the recent open lab at AIST on October 14th and 15th. This preview for Actroid F came out a few months ago, and you can tell they’ve made some fine adjustments since then. The video does, however, give you a better feel for the camera setup and use of the robot as a telepresence vehicle. 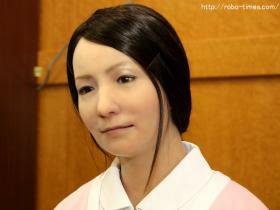 Japan has a sort of developmental alliance/network that has repeatedly pushed the envelope when it comes to life-like humanoid robots. You’ll almost always see Kokoro attached to these projects, along with AIST, ATR, and Osaka University. These four names keep cropping up in various pairings and collaborations as we’ve seen with the Geminoid F, the dancing HRP-4C, and the Telenoid. Japan looks to be trying to dominate the field of replicant robotics, and I think a lot of that can be traced back to Hiroshi Ishiguro. Ishiguro is one of the foremost names in realistic robotics in Japan (and the world) and is the mind behind the Geminoid and Telenoid (and probably a dozen other projects of which I’m not aware). What I find so interesting is that the research/industrial system in Japan is clearly willing to funnel a lot of money, time, and effort into projects whose products are…well…creepy. Actroid F is based on the frame and skin of Geminoid F seen here. The small improvements are clear, especially around the mouth. Of course, they’re creepy in a progressively realistic way, and that may be the key. It’s going to take years, and many iterations of new robots, before we can develop a bot that actually looks really human. But Ishiguro (and Kokoro, AIST, ATR, Osaka University, and many other groups in Japan) aren’t going to give up until they do. These guys are dedicated, have no doubt. From a certain angle, Actroid F really does look human. A bit too formal, maybe, a bit too stiff...but much closer to the real thing than you would see even a few years ago. In light of that dedication, I’m willing to sit down and watch videos of bots that raise my hackles and have my hands itching for the pitchforks and torches. Yes, Actroid F is situated firmly in the Uncanny Valley, but the telepresence innovations it is exploring (face mimicry, emotive simulations, etc) are going to be very useful in the future. Give it some time and replicant robots will be able to act and talk with our voices in a way that we find endearing instead of alarming. Give them a few more years beyond that, and we will be able to make replicants that can be customized to look like each of us, so they can help us tele-communicate with people we love as if we were in the room with them. We’re in the muddy part of the journey right now, but the path ahead is going to be worth the effort.